On Monday 7/17/17 Friends of Community Media filed a comment with the FCC protesting the abolishing of net neutrality regulations. Doing away with these rules, would give major media companies unprecedented authority to raise Internet service providers fees, and power to censor content on an open-Internet. Many thanks to Amy, Gordon, and Spencer for the work they put in to do this! 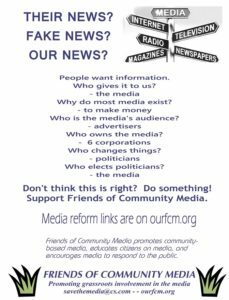 Kansas City, July 10, 2017 – On Saturday July 15th, Friends of Community Media (FCM) will convene the first of a series of forums on the media at 2:30 PM in the annex-room at 39th and Main (rear door) in Kansas City. This meeting includes a panel with open-media advocate Spencer Graves and (tentatively) Ernesto Falcon, an attorney and Legislative Council with the Electronic Frontier Foundation, a citizen’s advocacy group specializing in Internet law, and possibly others. Bring your concerns and questions. This forum will discuss the efforts of the Federal Communications Commission under the Trump Administration to reverse the 2015 Open Internet rules with a “Notice of proposed rulemaking 17-60A1 on Restoring Internet Freedom”: Trump’s FCC wants to restore the freedom of telecoms like Comcast to censor your internet usage, destroying net neutrality. The “data” justifying this change were cherry-picked, according to the New York Times, FCC Commissioner Clyburn and others. The forum will encourage citizens and groups to send comments on this proposed change to the FCC before their July 17 deadline and to your representatives in the US House and Senate. Perhaps the easiest way to do this is via “BattleForTheNet.com”. 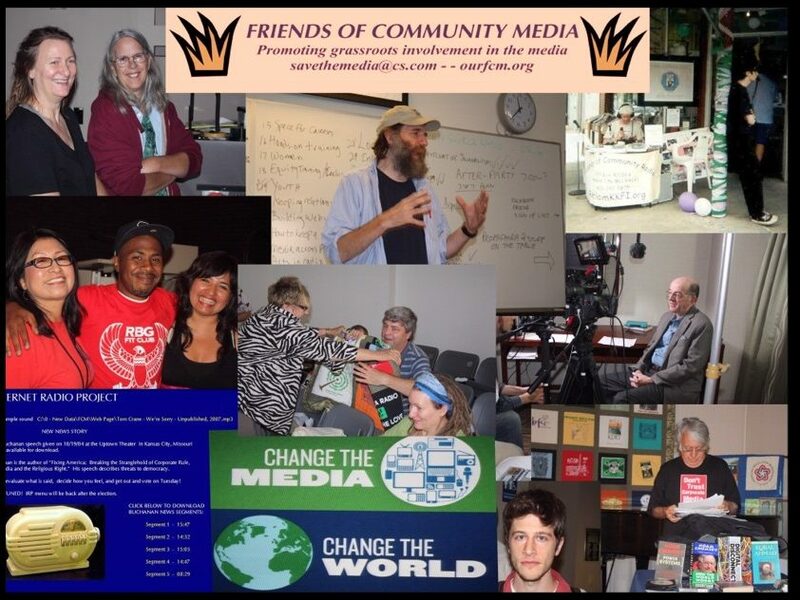 Friends of Community Media is a Kansas City nonprofit group working to enable citizens to create their own media and influence existing media. FCM promotes diversity both in media ownership and diversity in views that media portray to the public. Sam Gustin, “Most Americans Support the Net Neutrality Rules that Trump’s FCC Wants to Kill”, Motherboard, July 10, 2017. Meeting Sunday, 7/2/17 at 39th and Main 11:30 AM at the KKFI conference room to prepare the final draft of the FCM bylaws changes for presentation to the FCM board. All welcome to attend. 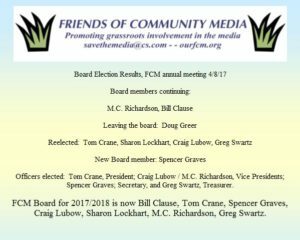 Next FCM meeting will be Saturday 6/10/17 at the KKFI annex, 39th and Main, Noon. Gordon suggested a by-laws change to remove the staggered terms and term limits for the time being, since we are a small group . This will be the second reading of the proposed change at this meeting, and be voted on, on June 10th. Text of the proposed change is available on this FCM website. Craig has agreed to work on a wholesale change of all the by-laws and a meeting to discuss this will happen soon. However, we will do the second reading of the by-laws change and vote on it. We have 10 voting members to enact a change, and a quorum of members according to the current by-laws must be met. Progress on planning for a late June event “War on the Media” will be discussed. We will also set up a calendar on the website which Spencer can maintain, and a media news blog which Craig has offered to maintain. A motion is in order to remove the following lines from Article VI, Section 2 of the Friends of Community Media By-laws enacted on 3/28/07. Just a reminder of what MC Richardson has been working on to make our organizations more inclusive. This would be a good chance to explain and learn why media awareness and reform are important. Attached is a flyer we will pass out as well an updated FCM fact sheet. I’d encourage anyone that can, to attend. KKFI MID-COAST RADIO PROJECT,INC. will host its FIRST Community Ascertainment Forum this Thursday April 20, 2017 in KKFI Annex Room 6-8 p.m. location 3901 Main Street after 5:00 p.m.
you must enter rear entrance and park in Great American Bank’s Parking Lot. Take elevator to second level. Mid-Coast Radio Project, Inc. KKFI is one of 200 Community Stations in the nation non commercial will bring together 18 Community Organizations, Agencies or Neighborhood Groups to voice their concerns and or issues for the betterment of Kansas City. These organizations are normally overlooked by previous held ascertainment gatherings, nor are the groups able to share their upcoming events with these meetings. Some of the guest organizations include: Black Agenda Group, KCMO and Northeast Johnson County NAACP, Greater Kansas City Buffalo Soldiers 150 Celebration, Juneteenth Emancipation Proclamation Celebration, KCMO Human Relations Civil Rights Div., Midtown Kiwanis of Kansas City, FIRST CALL Drug and Alcohol Abuse,, League of Women Votes of Jackson County/Clay/Platte Counties, NEW GRAY PANTHERS, Eggs and Enlightenment, 24 HOUR FAITH TRAINING CENTER, Friends of Community Media Hogan College Prep Academy, TY-COR Great Plains Indians and Watkins Foundation Slave Cemeteries History. This first of a kind event has invited various Media Groups located in Greater Kansas City which attendees can greet and meet. KKFI which is THE FLAG SHIP. And targeting PEOPLE of COLOR not limit to. Event Open to Public Refreshments served. Other KKFI Community Ascertainment Forums scheduled for 2017 are July 20th and October 26th. Interviews can be arranged and electric outlets are available if needed. NPR / PBS to fall under Trump budget axe?